If you ride the C line, or read reports about the MTA subway system, you know that the C is pretty much one of the worst lines out there. It’s got the oldest cars of any subway line. It’s infrequent, especially on weekends. Basically, it’s not supporting the growing population of Brooklynites who live off it. 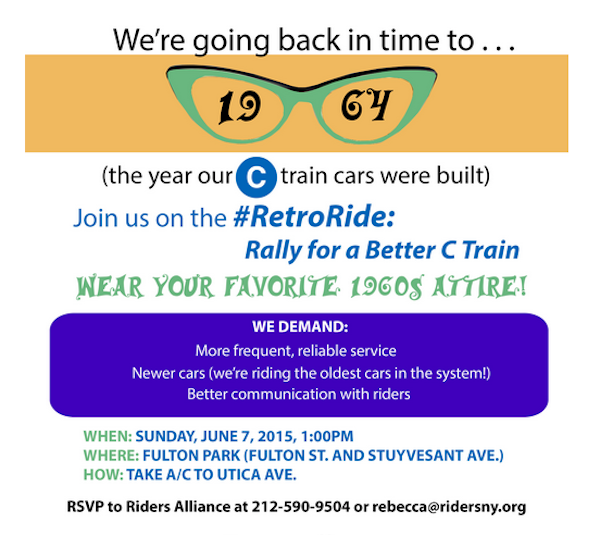 Riders Alliance does a lot of advocacy work regarding the C line and is holding a rally on the matter this Sunday. The theme is “1964,” the year the running C trains were built. As you can see above, Riders Alliance is demanding better, more frequent service, newer cars and a better communication system. The rally is happening at Fulton Park, off the Utica Avenue A/C stop. If you’re interested in attending, sign up here or RSVP to Rebecca at 212-590-9504/rebecca@ridersny.org.